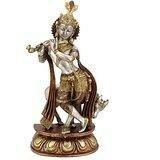 This is beautiful and brass Krishna Cow statue. Gorgeous Hand work and perfect showcase of Indian Handicrafts..Size : 14 Inches Height X 7 Inches wide X 3 Inches depth.Weight : 4.3 kg. Material : Brass with silver/gold polish.-------------- Pls beware from Copy product & ensure buying authentic product. This is exclusive inhouse design & product of Brand "Collectible India" and "covered by intellectual property rights laws". 'Collectible India' doesn t authorize any other Brand/Seller to sell it and we won't be responsible if any counterfeit or substandard product send by any other seller.